Athens’ standoff with EU creditors over the terms of Greece’s bailout risks turning into “a full-blown crisis” that could derail Europe’s economy, Chancellor George Osborne warns. In a last-ditch bid to thrash out a deal over the fate of Greece’s debt, eurozone finance ministers will meet in Brussels on Friday afternoon. Speaking in London on Friday morning, Osborne called upon his European colleagues to resolve their differences in the interest of Europe’s financial stability. He warned the current impasse between Brussels and Athens could progress to a deep-seated crisis, leaving Europe and Britain’s economies in tatters. The chancellor said citizens throughout Europe need the eurozone to agree upon a compromise. 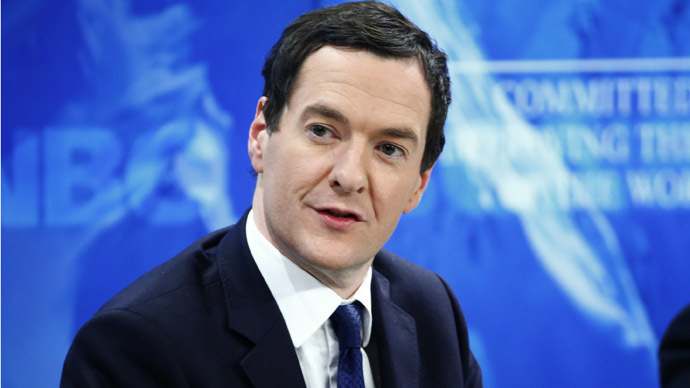 Osborne’s longstanding claim that austerity has bred positive results in Britain is challenged by economists nationwide. UK economist Michael Burke says the coalition’s austerity cocktail of “cuts to government spending,” suppressed wages and measures to artificially inflate consumption have bred acute inequality in Britain. He argues people in the UK are faced with “greater poverty, falling real wages and sharply deteriorating public services,” as a result. Since coming to power in late January, the largely leftist Syriza government’s challenge to the austerity diktats of EU policy makers has been clear. As it continues to collide with Eurocrats over plans to renegotiate the country’s debt burden, concern is mounting among neoliberal governments and international creditors alike. Syriza is seeking to renegotiate Greece's rescue package in a manner that will link Greek debt repayments to economic growth. The party's plans have been met with resistance from German Finance Minister Wolfgang Schäuble, who maintains Germany will not accept “one-sided” adaptations of Greece’s €240 billion (£180 billion) bailout. Friday’s meeting in Brussels follows Germany’s rejection of the Greek government’s written request for an extension to its loan program. He added a solution would only be reached with EU creditors if “mutually acceptable financial and administrative terms” were agreed upon. The German government took issue with this clause, stressing it was a “Trojan Horse” for the Greek government to have its bailout terms changed. It insisted Greece abide by its commitment to expedite austerity policies embedded in its bailout agreement. Earlier this month, Osborne said Greece’s standoff with eurozone governments and international creditors poses a greater threat to the global economy than conflict in the Middle East, climate change and rising tensions between Russia and the West. If Greece fails to reach an agreement with Germany, its Syriza-led government could face insolvency. The state’s current bailout program is due to expire on February 28. Critics say the standoff between Berlin and Athens is partly the result of clashing personalities between left wing Varoufakis and right wing Schäuble. Friday’s talks in Brussels are expected to be tense. They mark the third attempt in 10 days to resolve an impasse that could culminate in Greece’s exit from the eurozone. In an effort to address the deadlock, German Chancellor Angela Merkel discussed matters with Greek Prime Minister Alexi Tsipras on Thursday evening. Officials based in Athens said the conversation was “constructive,” with both parties keen to find a solution. The officials added Merkel had adopted a more conciliatory position than Schäuble has demonstrated of late.